The annual Consumer Electronics Show has come and gone, with the usual array of new gadgets ranging from the cool to useless, to vaporware. Over at RadioSurvivor I covered some of the news relating to radio. 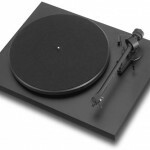 Along with radio and a metric ton of iPod/iPhone accessories, there were some new vinyl playback devices at CES, too. Stereophile magazine covered the high-end arena of $4500 phono cartridges and $11,000 turntables, otherwise ignored by the rest of the mainstream electronic press. 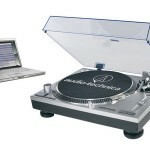 What caught the typical reporter’s eye was a bevy of new cheap plastic turntables studded with USB connectors and memory card slots. The LA Times’ music blog notes the models offered up by retro-plastic purveyor Crosley and space-age plastic pusher Ion. As I’ve noted before, the actual record-playing parts of these “new” turntables are tried-and-true knockoffs of the flimsy plastic turntables previously seen on your mid-80s compact stereo. What's old and crappy is new and crappy. 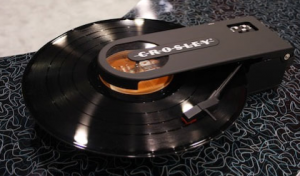 Bloggers seemed particularly excited by the Crosley Revolution turntable, which, as Retro-Thing points out, is a knock-off of the 1980s Audio-Technica AT-727 Sound Burger record player. Although R-T’s James Graheme recalls that it has “an almost mythic reputation for high-quality sound,” my own recollection is that they were fiddly and mediocre at best. Sony had its own versions of the platter-less record player in the 80s, too, the PS-F5 and PS-F9. Because their unusual design both have also achieve a near-mythic status. But mythic does not necessarily mean good. Again, I must argue that the “innovations” of linear-tracking and platter-less turntables in the 1980s contributed to the widely-held perception that vinyl provided low quality sound. I’m not so certain that these approaches were inherently wrong-headed. Rather, I’m inclined to blame their application in increasingly light-weight plastic components. That’s why none of these technologies have been seen again since the 1980s… until now, that is. Shades of a proven, time-tested design. 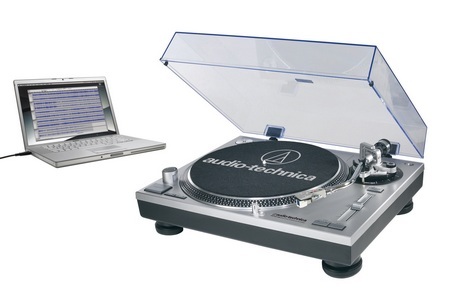 the Audio Technica AT-LP120-USB ($429 list, $299 street) offers a shining ray of hope. Clearly built as an homage to the classic Technics SL-1200MK2, the AT-LP120-USB seemingly offers old-schoolers a way to straddle the analog and digital music realms in style. Unfortunately Bell is one of few voices of reason outside the high fidelity press. 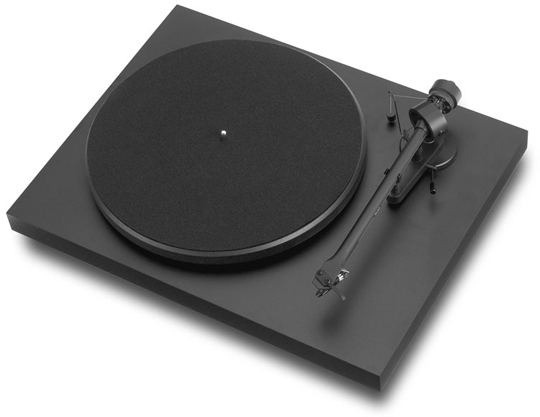 It’s a bit of shame that the simple, no-frills but high-quality designs like those from Pro-ject and Music Hall aren’t more widely available or covered. Myself, I rock a five-year-old Pro-Ject that shows no signs of fading. If one of the mass-merchandise manufacturers were to knock-off one of these, rather than a discredited 80’s plastic wonder, it would do a wonder for the nation’s ears and the long-term viability of vinyl. Frankly, I’m a little amazed that the vinyl renaissance seems to be thriving as long as it has, especially given how many of the new turntables out there are a bad 80s flashback. Some might argue that the prevalence of MP3s has numbed the country’s ears to true fidelity. I don’t quite buy that argument. MP3s can actually sound pretty good on decent equipment, and the dominance of digital audio has trained us to be less tolerant of added noise. My best guess is that the continuing vinyl resurgence is really based on sound quality, in as much as vinyl sounds simply different than CDs or MP3s, and can sound better on good equipment. I also think it’s due to the inherent physicality of the LP. It’s bigger size makes the whole album package somewhat more aesthetically pleasing than the CD jewel case. But the starker contrast stands out when compared to the intangible nature of MP3 files. As someone who is enjoying the increased availability of new vinyl records, I guess I shouldn’t complain too loudly about the plastic turntables, since they appear to be sparking demand. 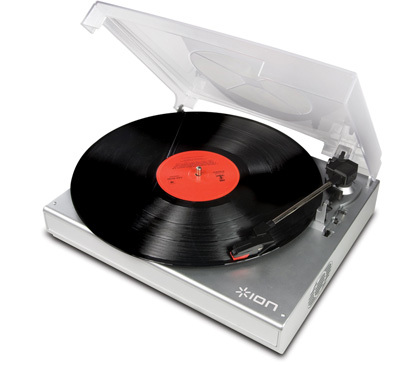 I just hope that at least a few enthusiasts newly awakened to vinyl’s allure will listen past their entry-level IONs or Crosleys and consider a nice used or new turntable that will really let the music shine through (and will also last decades longer, I bet).